That would be in the 3.1.0 upgrade documentation, if it existed yet. the feature needs to be enabled on the controller. On the 3.1.0 configurator, go into the global controller options and enable the one option listed. Be sure to click 'write to controller'. Your switch should now allow you to flip between configurations. Also look under the configurator options; you can set it to re-fetch the configuration if it sees that the configuration has changed. If you still can't flip configurations make sure you driving +5v into the option port for configuration 2, and GND for configuration 1. Now have the latest firmware up and running OK. Must say the car runs alot smoother, will need to adjust map now that the load points have been adjusted. I have installed a switch to be able to swap map. But can't seem to be able to. allowing a simple 2 wire connection to the switch. I've been looking at the V3 schematics, and wondered, could the 5.1V Zener (D1) be replaced with the 10K pull down resistor? Then there would simply be 2 wires to the switch (Option and Vref) for a logic 1 and the pull down resistor would give a logic 0 when the switch was open circuit? 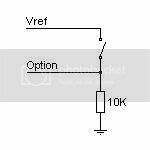 Don't even think about replacing the Zener diode with a resistor as you will lose all overvoltage and spike protection on the input pin of the microcontroller. Even if you use Vref as proposed, include the current limiting 120R to make sure you can't fry anything by connecting or contacting 12V on one of those 'brain fade' days.